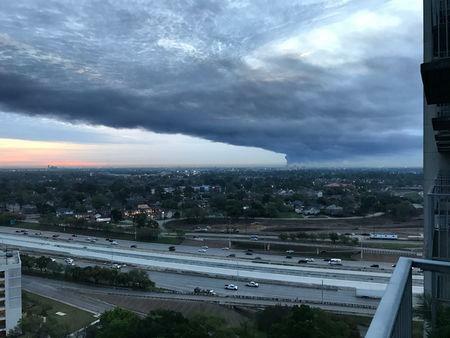 HOUSTON (Reuters) - Ship traffic was halted for a third day on Sunday along a key stretch of the United State's busiest oil port as emergency workers siphoned fuels from the Houston Ship Channel that leaked from a massive fire at a nearby petrochemical storage facility. Fuels spilled after a 10-foot (3-meter) wide section of a containment barrier breached on Friday at Mitsui & Co Inc's [MTSUIF.UL] Intercontinental Terminals Co (ITC) in Deer Park, Texas. Before the wall was repaired on Saturday, the breach sent fuels, water and fire suppressant foam to a waterway that connects Houston to the Gulf of Mexico. State and federal authorities have begun investigations into the fire and the company's compliance with environmental and safety regulations. On Friday, Texas filed a lawsuit against ITC alleging unauthorized air pollution and unauthorized outdoor burning, citing the three-day fire and releases of benzene and volatile organic compounds into the air. The suit seeks at least $100,000 in civil penalties and costs.